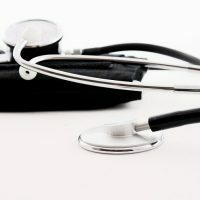 Monitoring your health is extremely important if you want to stay healthy and prevent any future diseases or illnesses. This gets even more important as you get older. While you can easily get some basic health checks done through your GP, sometimes we don’t always trust our doctors and we want to get tested privately, right? At least this is what I experienced personally before. And I am sure I am not the only one who feels like that. Besides, doctors won’t always send you for blood tests if you ask them. There has to be a good reason for it. So no wonder home blood tests are becoming so popular now. They are quite affordable and it’s not too complicated to take your own blood at home. You get results faster than if you were to use your own GP which is another reason why people do it at home. 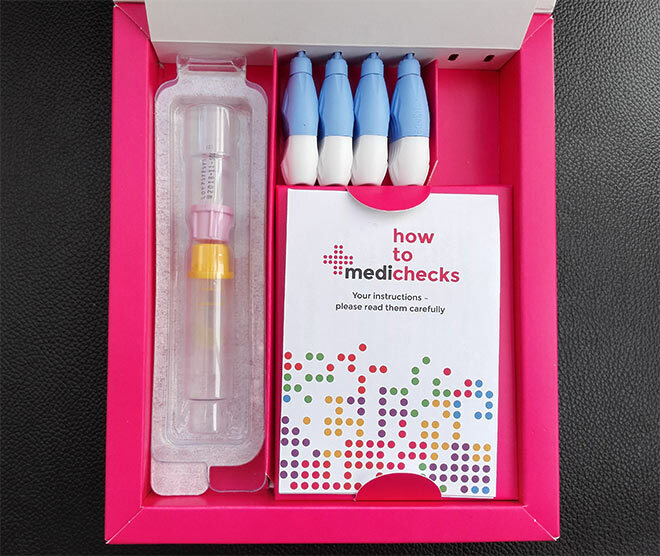 There are a few different private health screening companies that you can use to purchase home blood test kits online but the one I have personally used and recommend is Medichecks. Well Man Ultravit: Advanced health check for men that includes key markers for blood health, liver function, kidneys, cholesterol and more. Well Woman UltraVit: Advanced health check for women that includes thyroid function, female hormones FSH, LH and oestradiol as well as ferritin, vitamin B12, folate, vitamin D and magnesium. Essential Blood Test: A comprehensive health screening which provides valuable insights into your current state of health. The Essential Blood Test includes tests for diabetes, iron, cholesterol, inflammation as well as kidney and liver function. Thyroid Check Plus: TSH, FT4, FT3, thyroid antibodies. Liver Check: A simple blood test to look for signs of inflammation and damage to the liver which could indicate liver disease. In the past I have personally bought a cholesterol check from Medichecks for my fiance and most recently I was sent Well Man Check for the purpose of this review. 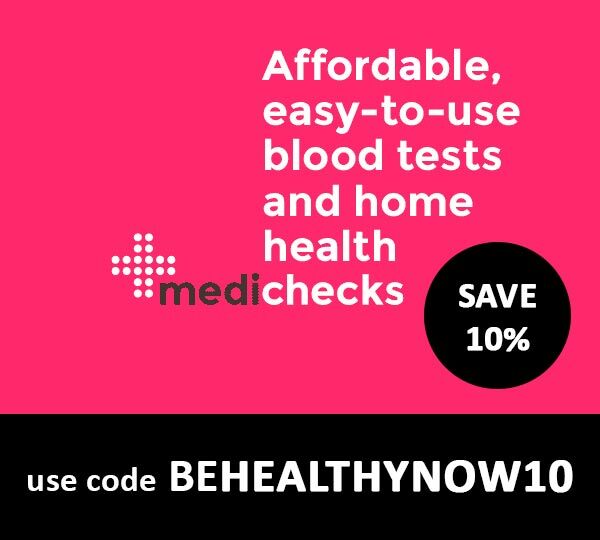 If you want to purchase any of Medichecks health screenings or home blood tests, you can get 10% off by using a discount code BEHEALTHYNOW10. Click here to activate. We’ve had a good experience with both tests. The test kits arrived very quickly after the order – they came with the first class post the next day which I was really happy about. 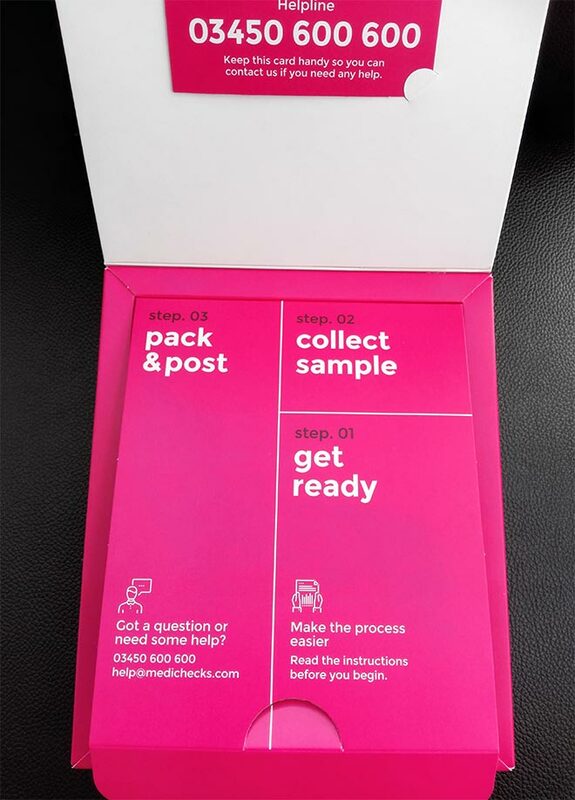 The Medichecks home test kits are well put together and come with the detailed instructions so you can’t get it wrong. I suggest you read the instructions a couple of times before you do the test, just to get a clear idea of the whole process when taking blood at home. This is especially important if you haven’t done any blood tests at home before. Don’t worry, it’s not that difficult and the bit when you pierce your finger with a lancet is over very quickly! Just keep in mind that blood tests should ideally be done in the morning (on an empty stomach) to ensure accurate results. You also need to do your blood test between Monday and Friday and make sure you post it on the same day. That’s to ensure the laboratory receives your blood samples as soon as possible after you’ve taken them – this minimises the risk of spoiling the sample when sitting in the post for too long. If you don’t follow every single step as stated in the instructions, then your sample won’t be usable for analysis and you will have to do it again. So DO try and follow all the instructions provided by Medichecks. What I really like about Medichecks is that if you are not sure of something or are having issues with anything, then you can easily contact them – their customer services number is provided with the kit together with their email. We had to fill in two collection tubes with blood (for Well Man Check) which did take a bit of time but it is possible as you get provided with more than enough lancets. We used two. It’s good that the home kit contains slots where you can put your collection tubes in – this makes the blood collection a little bit easier. To encourage the blood flow, it’s recommended to do some gentle exercise or take a warm shower beforehand. Alternatively, you could just wash your hands in warm water. You should also be well hydrated. 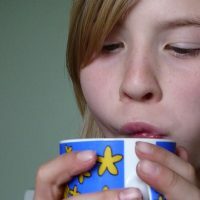 So before you do this blood test in the morning, make sure you drink a glass of water or some tea with no sugar. You have to try and do this test as quickly as you can as blood can clot very quickly. And after the collection tube is full to the correct line, then you quickly close it (make sure it clicks) and then invert the tube 10 times. This is a really important step. You have to invert it and not shake it. If you don’t do this, they may not be able to use your sample for analysis. 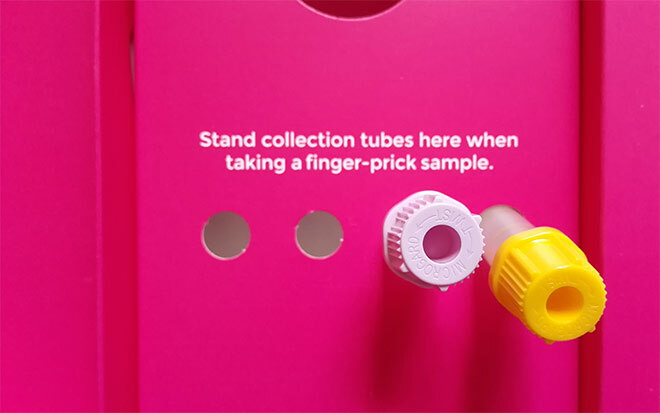 After you have collected your sample, complete the date and time on the named labels and apply labels to each tube with the details clearly visible. Place the collection tubes into their protective packaging. The final step is to place the lab request form with all the filled sample tubes into the return envelope and post it on the same day. Once you have posted your envelope to the lab, make sure you log on to mymedichecks.com and input your ‘sample sent’ date which will enable Medichecks to keep track of your sample. For Well Man Check we followed all the instructions and thought we did everything correctly but unfortunately, there was a problem with a sample (they couldn’t do the whole analysis). I think what happened was my fiance was squeezing blood out of his finger too strongly and he probably damaged some of the blood cells like that. It says in the instructions to gently massage your finger to the tip to produce drops of blood. Luckily, if the blood sample you provided is not sufficient or was spoiled, you just request another test kit online free of charge. We did that and the kit arrived the next day. Really impressed! The second time we were lucky and the sample was fine, fit for analysis. I’ve been really impressed with how fast you get the results after you have posted your blood sample to Medichecks laboratories. It takes no longer than 3 days to get the results! Now, that’s not very long, is it? We posted the envelope on Monday and we received the results on Thursday. Not bad, right? Better than any GP! And compared to some other private healthcare companies, Medichecks are extremely fast. The Well Man Check that my fiance did, tested for things like liver and kidney function, cholesterol, diabetes and red and white blood cells. The results showed that everything was fine apart from the increased cholesterol which was an already known issue. Another bonus: With the results, you also get some advice and recommendations from a doctor and if needed you can ask them some questions. All in all, Medichecks are a great private healthcare provider of various health checks and health screenings that you can do at home. They have an amazing selection of health screens and home blood tests that you can purchase, from cholesterol check to a general health screen and thyroid check, they do it all. Their home test kits are well put together and contain everything you need to complete the test correctly. They also have support for customers who need help with their blood tests at home. Another big plus is that their results arrive fast and you also get a bit of advice from a doctor. While not everybody will be able to afford them, Medichecks are great if you want to monitor your health without the hassle of going to your doctor’s and waiting a long time for your results. If you want to purchase some of the health tests or health screenings from Medichecks, you can get 10% off by using a promo code BEHEALTHYNOW10. Click here to activate. Disclaimer: This post contains affiliate links which means that I may get rewarded a commission if you purchase a product after clicking on a link. This does not cost you anything. For the purpose of this review, I was sent a complimentary test kit Well Man Check but I also bought a test kit from Medichecks personally before. This is an unbiased review based on my experience with Medichecks. This is such a useful post have been trying to find somewhere that does this as it can be so hard to get the docs to do a blood test.